When most Americans think of us Brits and our tea-drinking habits, visions spring to mind of a bunch of hoity-toity well-todo folks sitting around drinking fancy loose-leaf tea in finest bone china supplemented by crustless sandwiches and little pastries. For those that have lived outside of the upper crusts of London, the reality is far from it. Good tea , comes in a little bag (without strings!) – and common brands like Tetley, PG Tips and Ty-phoo are the workhorse of the country. The trick is in the timing, how long it&apos;s steeped and the right amount of milk. 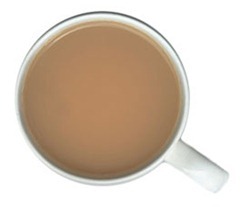 It&apos;s not uncommon to drink five or more cups of tea a day. It&apos;s a social thing, and a small-gesture thing too. Friend come over for a chat? I&apos;ll put the kettle on. Plumber comes over to fix a pipe? First thing after opening the door is to offer him a nice cup of tea. Workmen swinging from scaffolding chipping away at bricks, always have a thermos-flask of hot tea on hand for frequent breaks during the day. This is where Builder&apos;s Tea finds its roots: often made from cheap tea, it&apos;s steeped stronger that normal, piping hot, more milky than normal and usually with a couple of sugars to soften the blow. There is quite possibly no better feeling in the world, than sitting on top of the peak of a mountain your just conquered, a little chill in the air, maybe some drizzle, the sound the the stove going off and sipping on a big mug of Builder&apos;s Tea. I don&apos;t often go to the effort of breaking out the stove mid-day, but I&apos;ve had some epic cups (Mt. Rainier, Pasayten etc) of Builders Tea brewed by my friend Nigel that will have a spot in my memory for a lifetime. This entry was posted in Backpacking, Food Reviews on August 10, 2011 by brettm. As an ex-pat now here in the US I have to admit that I still drink several cups of “builder’s tea” as you put it throughout the day. Right now it’s PG Tips because that’s what I was able to get hold of, but I bounce between the most popular commoners brands. In fact, I think I’ll put the kettle on right now and make a fresh pot of tea – you want one? Brian – sounds excellent! Milk no sugar please. Nice site too – I’ll add it to my blogroll. Always good to support a fellow limey. What is and where is Builders tea?? A spoon full of sugar and a little milk,mmmmmm..